The Boston Celtics showed up all in black. Gerald Green, Avery Bradley, Jae Crowder, even Kelly Olynyk arrived in coordinated colors, though they denied there was any plan or significance to the clearly intentional fashion decision. The atmosphere, chippy before the game even began with Jaylen Brown shouting at Kelly Oubre to remove his personage from the court in less amicable terms, seemed to foreshadow an epic clash to come. Amir Johnson got the start yet again, having earned the role after the last game's spry performance. Al Horford won the tip, and got Boston n the board early, only to see Markieff Morris answer back with a trey. Washington broke out to an early lead, but Boston pulled back within one with 6:30 left in the first with a three from Isaiah Thomas. Both teams struggled from the floor, shooting 8 of 23 from the floor early on, with both teams combining for 7 turnovers before the quarter was even over. 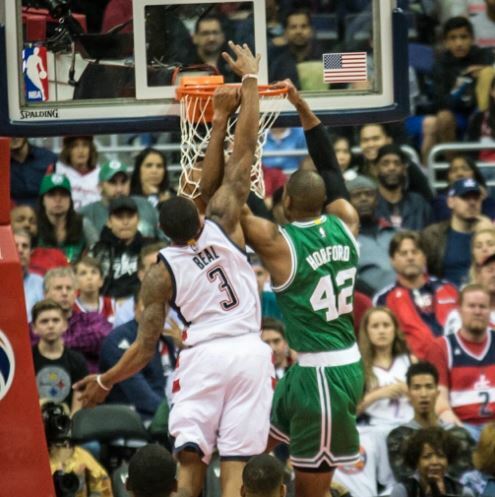 A John Wall slashing drive to the basket built the lead back to five for the Wiz at the three-minute mark, and free throws from Thomas and Horford got the Celts back to down one with just over two left. A late out-of-bounds call erased a Brown bucket, leaving Boston without a field goal for the final five minutes of the first, yet somehow only down five at the end of the first quarter despite shooting 23%. Avery Bradley is the one Celtic with any kind of offensive rhythm early. He's 4-of-8 from field. The second quarter opened to trading buckets from the Bradleys (Avery and Beal), but a bucket by Ian Mahinmi pushed the Wiz lead to seven. Terry Rozier missed a gorgeous eurostep a few possessions afterwards, but Bradley salvaged the play, wresting the board and laying it in to leave the Cs down three with just under nine in the half. He then tied the game with a trey, shooting better than the entire rest of his roster at 4 of 8 from the floor. Boston managed to squander the good fortune in a hurry, though, with Jason Smith and Beal scoring while the Celts turned the ball over on back to back possessions. The bench wasn't much help, shooting only one of nine from the floor with six left in the half. A Horford bucket broke the field goal drought at the five-minute mark, but Morris and Beal pushed the lead to nine with four left, forcing a Boston timeout. Brown took a hard hit after some aggressive play on the offensive end, causing a stoppage in play after catching an elbow to the face by Morris that was ruled a loose ball foul. Thomas answered with a trey to cut it to seven, and Bradley free throws to five, a Horford trey to just two, and a Crowder make tied the game with just under a minute left to play. An alley-oop from Horford to Bradley closed out the half with Boston up 42-41 for the first lead since the opening tip. The second half began with a missed Beal trey and a Horford layup, and while Boston couldn't buy a bucket, atrocious shooting by Wall and Morris kept the Celts in the lead. A Horford dunk pushed the lead to five with nine in the third, but a Wiz surged back, tying the game at just under eight with a corner three. Amir got on the board with a layup, and Avery held the lead with a bucket of his own, with Crowder pushing the lead to six with five to play. A Morris dunk cut it to two, but a trio of Horford, Bradley and Thomas treys fended off the Wizards run to finish the third on top 69-66. You know, the #Celtics are one win from the East finals and these announcers keep talking about them like they're just a cute little team. The final frame opened sloppy, with both teams missing shots and turning it over until Beal began to heat up with a pair of buckets giving Washington their first lead of the half at just under ten to play. A Bradley three took the lead back on the next play, but Beal tied it with another layup, only to get his own shot to the face while fouling Smart. Marcus only converted one of the two, and fell behind again on a Wall layup. Thomas repaid the favor, but Beal took the lead back with 6:30 left. A Morris goaltend tied the game, but Wall answered right back. A Thomas three wrested the lead back with four left, and then Otto Porter buried a trey of his own to go up two. Jae tied it up from the line, and IT took the lead with a layup at the two minute mark and a clutch three after a crucial stop. Smart took a charge on the next play, giving Boston possession with a five point lead with just a minute to play, only to see Beal drain a three of the game to pull it to within two. Thomas had a trey blocked on the next play, and Wall, getting fouled, tied it up after converting from the charity stripe, 87-87 with 40 seconds left. The Bradleys traded buckets yet again to tie it up at 89 with 14 seconds remaining, with Brad Stevens drawing up a play on a timeout giving Horford a bucket. Wall answered back with an ice-cold three, his first of the game, to give the Wiz a one-point lead. A broken play was bailed out by a Oubre foul, but Boston couldn't get another bucket, giving the Wizards the win, 92-91. Boston next faces Washington at home on Monday night, 8pm EST in the final game of the series that has seen the home team win every game; let's hope that trend continues. For more stories about the Playoffs on CelticsLife, click here. For more by Justin, click here.